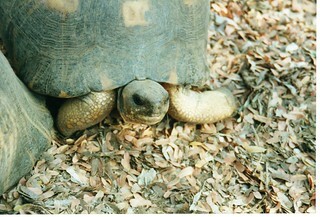 Radiated Tortoises at Kaleta Reserve near Amboasary in southern Madagascar. The radiated tortoise (Astrochelys radiata) is a species in the family Testudinidae. Although this species is native to and most abundant in southern Madagascar, it can be also be found in the rest of this island, and has been introduced to the islands of Réunion and Mauritius. As the Radiated Tortoises are herbivores, grazing constitutes 80-90% of their diet, while they also eat fruits and succulent plants. A favorite food in the wild is the Opuntia cactus. They are known to graze regularly in the same area, thus keeping the vegetation in that area closely trimmed. They seem to prefer new growth rather than mature growth because of the high-protein, low-fiber content. These tortoises are, however, endangered, mainly because of the destruction of their habitat by humans and because of poaching. The oldest radiated tortoise ever recorded was Tu'i Malila, who died at an estimated age of 188, the oldest tortoise being Adwaita. Unfortunately, these tortoises are critically endangered due to loss of habitat, being poached for food, and being over exploited in the pet trade. It is listed in Appendix I of CITES (Convention on International Trade in Endangered Species of Wild Fauna and Flora), which prohibits the import or export of the species under most conditions. However, due to the poor economic conditions of Madagascar, many of the laws are largely ignored.